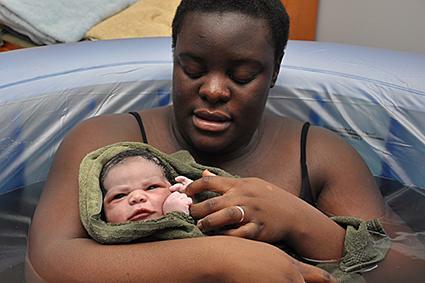 Home birth is a controversial topic in the United States. For centuries, home births were the standard, but hospital births became more common during the 20th century. A movement is afoot, however, and many women are opting to return to a more natural and nurturing way of giving birth: in their own homes. In many European countries, home birth is still the primary method of having babies, with hospitals reserved for times when complications arise. In order to determine whether home birth is for you, it's important to look at all the facts. Mothers-to-be cite numerous advantages to home births. Many women who have tried it once are eager to do it again, and many first-time moms find this birth setting less intimidating than a clinic or hospital. You get to remain in comforting and familiar surroundings when you give birth at home. You can give birth in your bed, in your bathtub, or in your backyard. You can have a water birth without worrying about hospital policies. You will be more comfortable in your home environment than in a hospital, and consequently, there is a belief your labor will be easier, shorter and less painful. Your children can be as present if they wish, as well, without being intimidated by hospital or medical personnel. You won't have to worry about childcare. Your children can watch you give birth, or be in another room, close to you and other family members. Additionally, you can have as many people there as you want without worrying about hospital guidelines. If you opt for a hospital birth, you'll have to drive to the hospital while you are having contractions. With a home birth, that's not a worry. Instead, your midwife comes to you when you're ready. In the meantime, you can continue to distract yourself from labor pains with cooking, watching movies, listening to music, cleaning, or chatting with friends for as long as you want. You can participate in any birthing rituals you want, including drumming, candles, incense, art, and others that might not be acceptable in a hospital. In hospital births, the C-section rate is about 34 percent. That rate rises even higher when doctors use pitocin (synthetic oxytocin) to induce labor. A 2005 study of home births showed the overall c-section rate of these types of births at 8.3 percent. At the hospital, interventions are common and may include epidurals, forceps deliveries, and administration of pitocin, among others. If you opt for a home birth, midwives do not traditionally intervene in such a manner, meaning you will have a natural childbirth. Your midwife may perform some minor checks on you, such as blood pressure readings, fetal heart rate checks, vaginal checks and possibly other readings as she feels necessary. However, you will generally have far fewer interventions than in a hospital. When the baby's born, you get to stay home and bond. You don't have to be moved to a non-private postpartum room with a roommate who has just given birth, nor do you need to be separated from your family and partner at night. You also will not need to worry about your baby going to a nursery and getting interventions you don't want. There are no concerns about driving home in questionable weather, or if the car seat is installed right. After you give birth, you can curl up in your bed and enjoy your baby! While pregnancy and childbirth is natural and not an illness, there is always the possibility that something may go wrong. This is one of the reasons many prefer to give birth in a hospital. If something goes wrong, you will have to be transported to a hospital. Many midwives will not accept clients that are not within a prearranged mileage of a hospital. Hospitals are well-equipped to take care of fetal or maternal emergencies. In these situations, when timing can be extremely important, you may not want to take valuable time to get to the hospital. You cannot get pain medicine in a home birth. For many women, this is a deal-breaker. They know they want an epidural, and in that case, a hospital is the best place for them to give birth. Additionally, some women may not be able to anticipate whether they will need pain management, and home birth may not be the best option for them. Midwives assist with the process of home birth. A midwife will meet with you before your birth to discuss her birthing philosophy, your wishes and tips on how to get through labor without pain medicine. She'll answer questions and talk about her plans in case you have to be transported to a hospital. You will have to seek, interview and hire this woman yourself. You might have to hunt for a midwife who meets your qualifications, but it's worth it when you find her. Additionally, not all midwives perform home births. When selecting a midwife, be up front about your birthing plans. You feel confident that you understand the home birth process through reading, talking with experts, and taking a childbirth preparation class. You've hired an experienced home midwife to assist with the birth. You've made arrangements to quickly be transferred to the hospital if something goes wrong during your labor. You have friends and family who are willing to help. You understand the importance of getting proper prenatal care. You are in good health, eat a balanced diet, and exercise regularly. You have not had any significant problems with your pregnancy and/or expect a smooth delivery based on your previous pregnancies. You have a plan for natural pain management techniques you can use during your labor. Preparation for your home birth is key for a successful and safe birth. For centuries, mothers gave birth at home. While the hospital is best in some cases, a home birth can be a safe, beautiful experience that allows a mother to give birth in a comforting and familiar environment without major interventions.